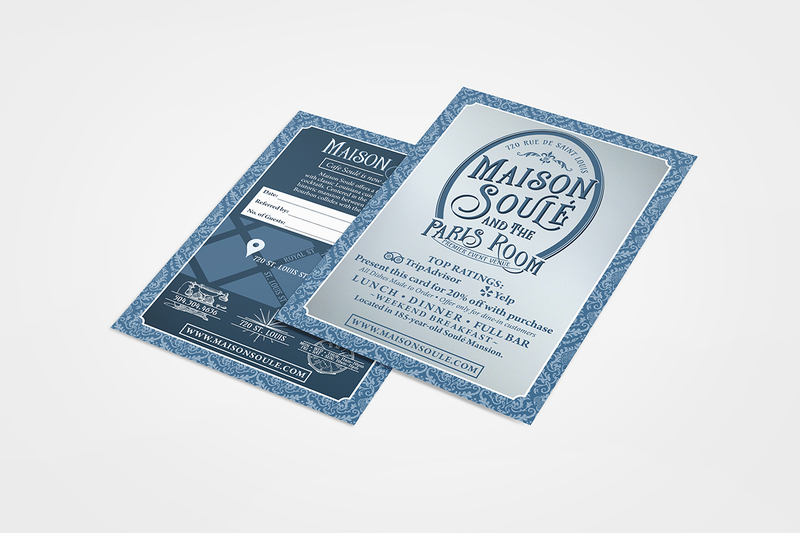 Maison Soulé is housed in a historic home formerly owned by several iconic figures and originally built in 1832 by Pierre Soulé, a French diplomat, politician and lawyer. 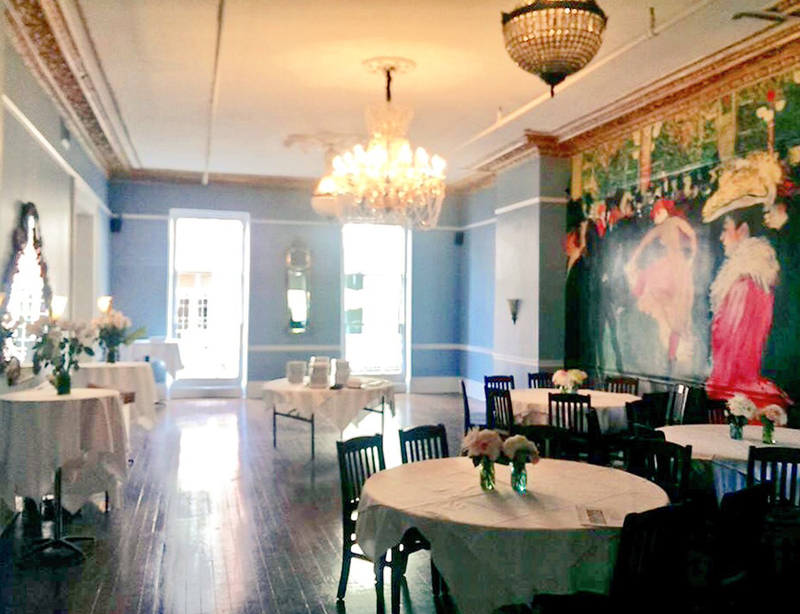 Now it is home to a Parisian-style restaurant, bar, and event venue called The Paris Room which can host weddings and large parties in the upstairs complete with a private balcony overlooking St. Louis Street directly across from Antoine's. Midnight Boheme met the owner in 2017 just as the former Café Soulé underwent renovations and it allowed the perfect opportunity to rebrand and restyle the venue with Midnight Boheme's signature "magic". Designing the new logo drew inspiration from classic vintage-style French parfume bottles and typography circa Toulouse Lautrec / Moulin Rouge. Midnight Boheme worked with OPA Graphics in the production of the hanging sign that can be seen along St. Louis Street in the French Quarter between Royal and Bourbon Streets. The logo consists of several variations to showcase the restaurant and venue space both together and separately. 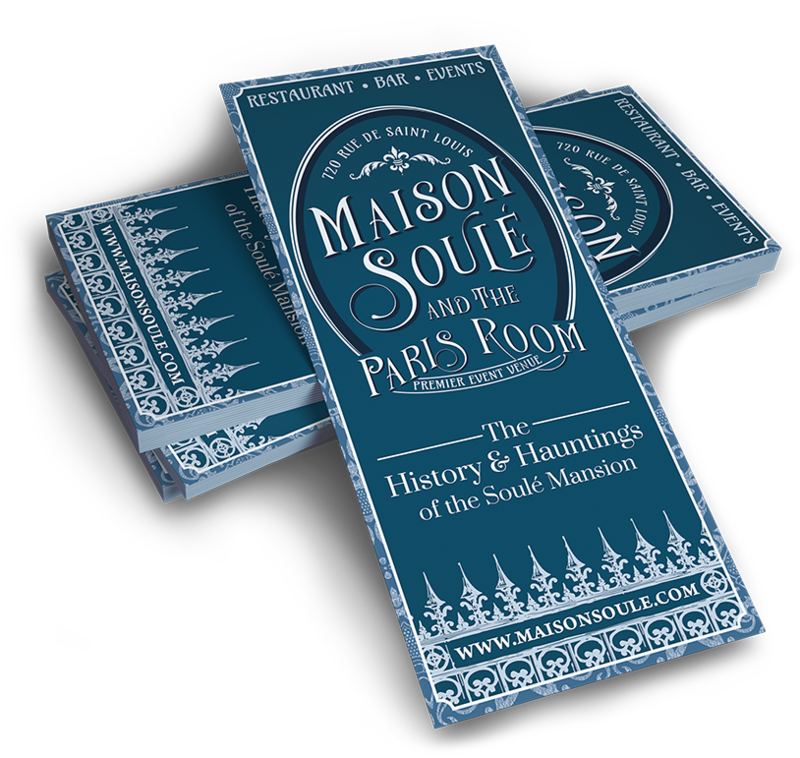 Midnight Boheme penned the history and hauntings of the Soulé Mansion in this trifold brochure designed by the author. 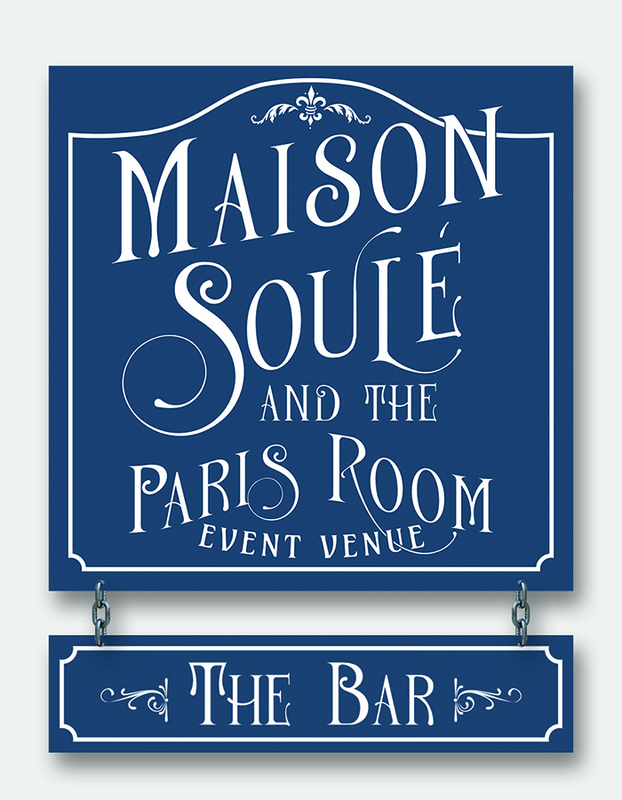 Upstairs in Maison Soulé, the Paris Room has become New Orleans' freshest premier event venue, hosting holiday soirées, birthday parties, banquets, receptions, business events and weddings. The restaurant caters from the downstairs kitchen and the banquet room offers private access to the upstairs bar and outdoor garden terrace plus a private balcony overlooking St. Louis Street in the heart of the French Quarter. Beer, wine, classic and specialty cocktails are featured in the customized bar menus. 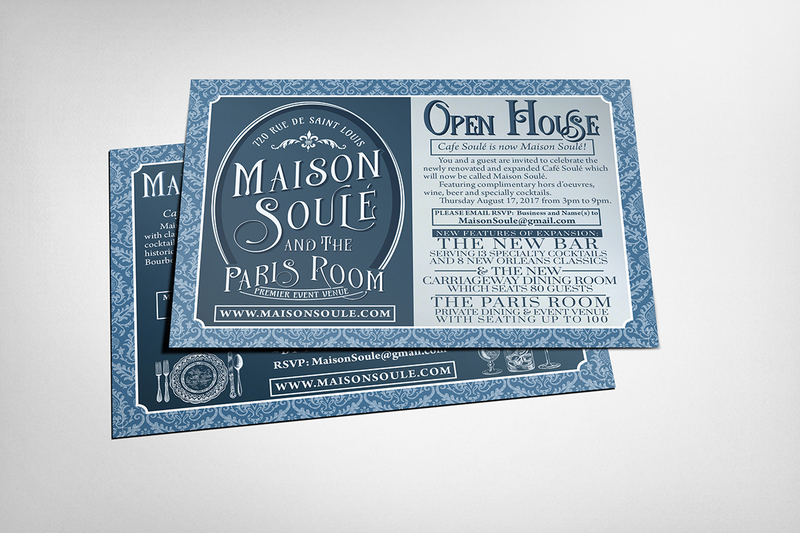 For the Open House, Maison Soulé sent out special invites to announce the rebranding and reopening of the recently renovated building. 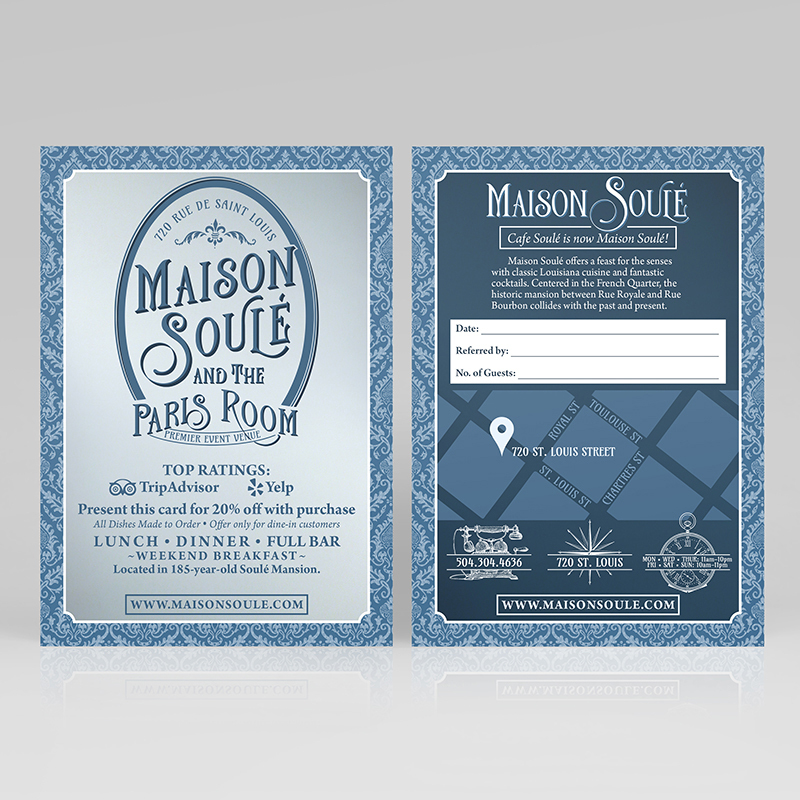 Featuring a location map and the stylish logo design, Maison Soulé continues to keep their new brand identity with every card and creation by Midnight Boheme. Researching the vast history of the mansion, Midnight Boheme uncovered hidden secrets of the almost-two hundred year-old building including a number of ghostly encounters by the patrons, cooks, and servers in the restaurant, all of which have been accounted for both on the website and in the brochure. So inspired by the many stories and fascinating historical figures that have owned or rented the house over the years, Midnight Boheme created numerous posters that have been framed and hung in the gated carriageway. 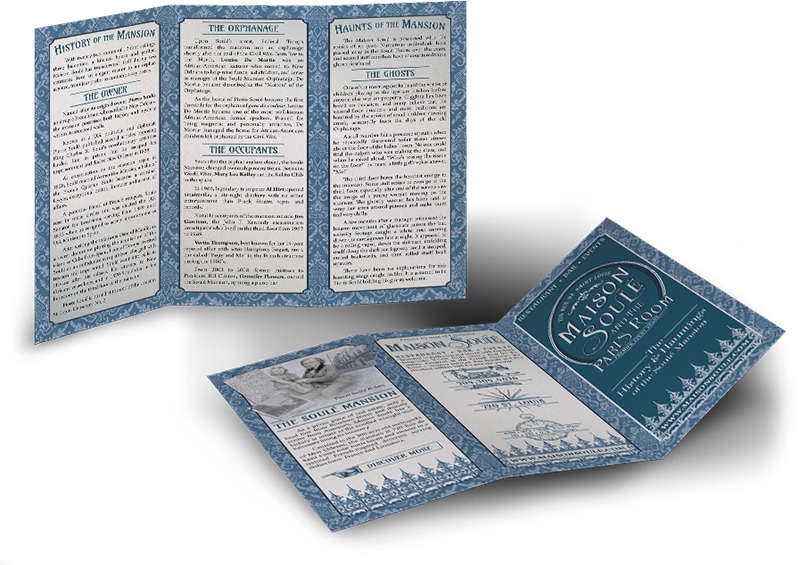 Stop by the mansion for a drink or a bite and read the historical descriptions as you enter! 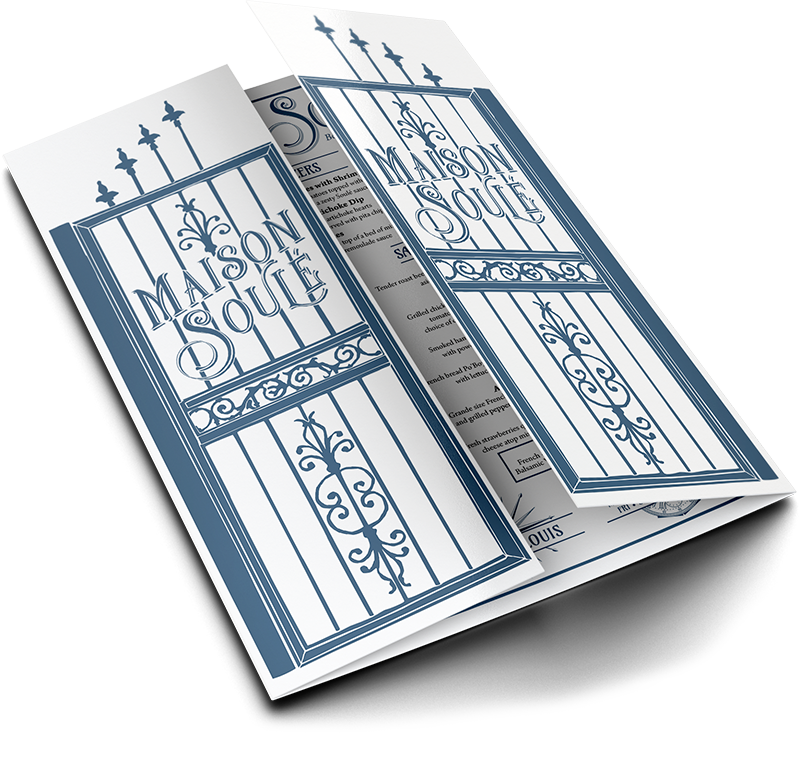 In a unique gatefold design, Midnight Boheme customized the outer folds of the menus to match the wrought iron gates that can be found in the Maison Soulé architecture. On the back of the menus, patrons can read the history of the restaurant while inside boasts the delicious menus for breakfast, lunch and dinner.